I can't even begin to describe how much I loved this book. It was seriously one of the best books I have ever read. I don't know if it is because of the fact that I used to love the show Roswell, and it reminded me so much of those days or it was because it was just that good. I am going to go with a mixture of both. The main character is Katy, who is a fireball, and she reminded me so much of myself that I just fell in love with her character. She is an avid reader and has her own book review site, she's nice to everyone but something about Daemon brings out her bad side. He is so mean to her, but I love it. There were some scenes in the book that my heart was literally breaking for her, and I don't feel that often when I read books unless I can really relate to the character I felt I was her. I loved Daemon's sister Dee, she just tries so hard to be nice and actually like a human. Katy never really understands why no one that knows Dee likes her. Katy really does try though. I really liked the concept of aliens, it was so different from any other book I have read. There were some swoon worthy moments, and I really loved the love-hate relationship between Daemon and Katy. Overall, this book is getting a whooping five owls. I loved it! 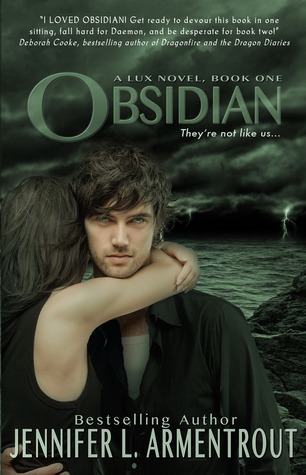 You can find Obsidian at Goodreads.